The GOMACO Commander IIIx will be a featured paver in the GOMACO booth at World of Concrete 2018. GOMACO’s Commander III has gone to the Xtreme and can now slipform a 24 inch (610 mm) radius. The Commander IIIx with G+ control system incorporates rotary sensored slew drives on each of the three tracks, sensored leg positioning, and independent travel circuits to each track to allow tight radius slipforming. GOMACO’s software engineers have developed a new Xtreme radius software bundle to make slipforming a tight radius on stringline easier than ever before. The operator simply programs the size of the radius into the G+ controller and as the Commander IIIx approaches the radius, the operator activates the radius program, and the paver slipforms around the radius with ease. The track angles, variable track speeds and other aspects of slipforming the radius are all managed by the G+ digital control system. Smart hydraulic cylinders on all three legs of the Commander IIIx allow G+ to know the position of the tracks at all times for intelligent All-Track Positioning. Smart hydraulic cylinders are also used for telescoping the mold mounting system for intelligent offset and repeatable mold offset. The trimmerhead and mold can be independently vertically adjusted for raising and lowering. The Commander IIIx accommodates Tier 4 engines and their cooling packages. It features an optimized cooling package with G+ controlling the hydraulic fan. G+ quiet technology makes this one of the quietest pavers on the market today while adapting the paver’s cooling needs to job-site conditions. It makes for both quiet and efficient paver operation. Improved fuel efficiency is another advantage with a power-optimized engine and load-sensed hydraulic circuits. G+ and its industry-leading technology is the control system for all of GOMACO’s concrete paving equipment, including their curb and gutter machines. GOMACO will have several of their curb and gutter machines on display at World of Concrete 2018, including the Commander IIIx, 3300, GT-3600, and GT-3200. Each of the four GOMACO machines will pave tight-radius curb and gutter, sidewalk, barrier or parapet, and more applications. High-volume concrete placing will be shown with the RTP-500 rubber-tracked placer. The finisher preferred by bridge deck contractors, the C-450, will be in the booth and set-up to finish a deck 32 feet (9.75 m) wide. Rounding out the GOMACO display will be the four-track GP3 slipform paver featuring two GSI (GOMACO Smoothness Indicators) mounted behind the paving mold. The GSI gives contractors the ability to monitor and trace the real-time smoothness results of the new concrete slab. GOMACO’s team of concrete paving professionals will be in the booth throughout the show to meet with contractors and discuss their projects and needs for 2018. GOMACO Corporation (GOMACO ) is the worldwide leader in concrete construction equipment with headquarters in Ida Grove, Iowa, USA. 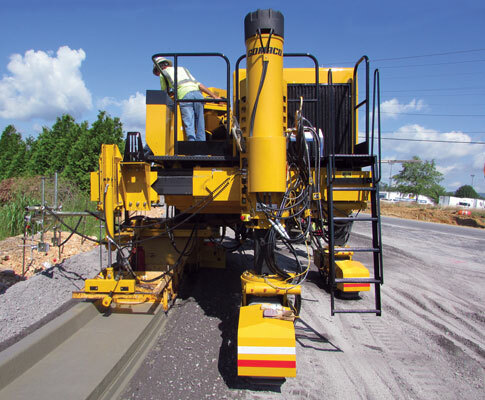 GOMACO equipment will slipform concrete streets and highways, airport runways, curb and gutter, sidewalks and recreational trails, safety barrier, bridge parapet, and irrigation canals. Support equipment includes grade trimmers, concrete placers, concrete placer/spreaders, and texturing and curing machines. The company also offers equipment to finish flat slabs, bridges, and slopes. GOMACO will consult on unique concrete paving applications and equipment needs. Products are offered through a worldwide distributor network for local sales, parts and service expertise.